Despite plenty of conjecture regarding Costa’s last Japan tour, he’s doing it again! Tickets go on sale when the website goes live on December 10th. Costa + Zombies = Profit! Operation Z is an upcoming 12-part DVD series billed as the “ULTIMATE guide to surviving a zombie apocalypse.” The first two parts will consist of ‘Introduction to Handguns’ and ‘Introduction to Rifles, Carbines, and Shotguns’, with release dates to be announced soon. 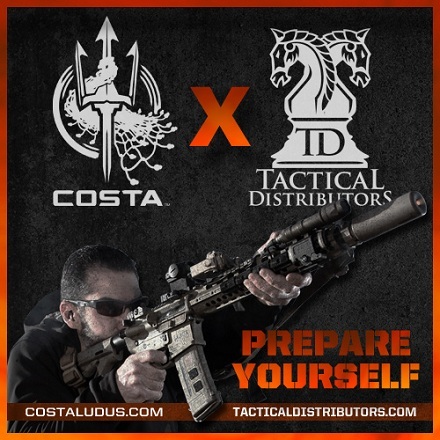 Tactical Distributors has just announced their partnership with Chris Costa and Costa Ludus. First up is ‘Costa’s Corner’, a dedicated page that highlights gear selected and used by Costa himself, including tactical lights, headlamps, clothing, and weapon accessories, all available for sale on the TD website. Also, Tactical Distributors will be the exclusive provider of Arc’Teryx gear that’s embroidered with the Costa Ludus logo.